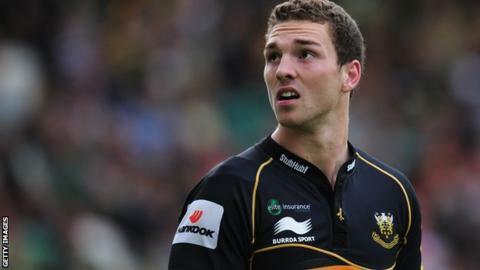 Northampton winger George North believes the whole squad is ready for the end of season run-in. Saints have spent most of the season leading the Premiership, but losses at Sale and at home to Leicester have seen them slip to second behind Saracens. Jim Mallinder's side sit seven points off the top and have an Amlin Challenge Cup semi-final with Harlequins to look forward to in the final months. "It's the money end of the season and where you make or break," North said. "You can do all the hard work in the grind of the season but when it comes down to it, this is when you've really got to step up. "I think that's what excites the players, coaches and fans; that you're one win from going a step further or going home." This weekend sees Saints go to Saracens in a top-of-the-table clash having already beaten them 41-20 in the league and 26-7 in the LV= Cup this season, and Wales international North believes that could be an advantage. "It will benefit going into it, but Saracens have been a dominant side and have performed very well all season," the 21-year-old said. "The squad is back together now with the boys being away in the Six Nations and we've regrouped. "When you're striving to be the best that rivalry kicks on and the past couple of seasons it's become a big game for the club." North moved to Franklin's Gardens at the start of the season from Scarlets on a three-year deal and has scored four tries in 16 appearances so far this season. That is in contrast to his form at international level where he has crossed 20 times in 40 appearances, and he feels there is more to come. "People think it's all finished and you know your stuff by now, but I'm still learning my trade," North told BBC Radio Northampton. "Coming to a new league and how they play has been great for me, working a bit more off the ball, looking inside nine and outside 10 or around 12 or 13 on the shoulder, trying to be a real pest really. "I'm learning how to work around being that marked man and trying to develop my game further so I don't always have to be that guy who is always on the wing."